Tactics delivers what it promises on the cover. This book provides you with an ideological framework to begin conversations about the faith-based issues that we all sometimes struggle to discuss and occasionally defend. 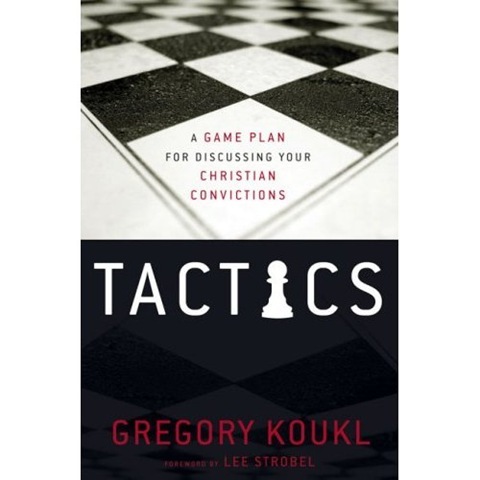 The author Gregory Kokul proposes a seemingly relaxed system of questioning that first requires gathering information. This will help clarify what the person actually believes and not force you to rely on generalizations that may or may not be accurate. It is pointless to debate questions that were never asked in the first place. After using that type of questioning to gather some of the basic facts, it is time to ask why people draw the conclusions that they do. Kokul uses the metaphor of the facts being the walls of the house while the roof is the conclusion. You can ask why that collection of facts support that particular conclusion. This is slightly more aggressive than the first tactic because it challenges your opponent to think. Finally, with all of this information in hand, it is time to progress to the final step of leading questions. These questions involve finding things that are perhaps lacking in the other party’s position and using questions to lead your opponent to the conclusion of his own argument’s inadequacy. Naturally, this requires that you have found a weak point in the argument that you want to actually lead your opponent towards. It seems to me that this is the most difficult but also the most powerful tactic when it is executed correctly. The second half of the book then applies this framework to a variety of questions that you might be asked. While it obviously is not a comprehensive list, it does hit most of the big ones. For the most part, I felt that this work accomplished exactly what Kokul set out to do in the beginning. He provided you with a theory that can help you approach difficult conversations with relative grace if you do it the right way. Because many people are uncomfortable with this issue, I think that having a set plan would be comforting and would therefore build confidence. That is absolutely the strength of this book. I found that many of his arguments at the end of the book were interesting, but I was left slightly confused. I know that this section was only intended to be a sampling of how to answer some questions that might seem difficult on the surface. However, the entire first part of the book emphasizes, I believe rightly, that each argument is going to be a little bit different. For example, many people might say that science has proven that there is absolutely no need for a designer. However, it is our job to find out why the other person has come to this conclusion. There might not be one set answer. Again, I thought that most of his arguments were rather strong in answering these common objections, but if you are training to practice the first part of the book, you do not necessarily want stock answers. You need to be flexible and able to move into the discussion in the best way possible. It might happen the way it does in the book, but from my experience, reality would probably be slightly different since every person is different. Also, Kokul mentioned almost immediately that it is necessary to have Biblical knowledge before you can expect to be good in these conversations. I agree with that entirely, but I do see how some people could simply take this game plan and run with it without doing any background research. The obvious danger in that is that you are prepared to knock down your opponent’s argument but do not have the Biblical knowledge to fill in the holes and ultimately make a difference in this person’s life. For this reason, I certainly think that this book is useful. The first section of the book provides an interesting and engaging read that I will say has given me some new ideas on how to witness to people. However, heed the warning given by Kokul and emphasized by me. Make sure that you have basic Biblical knowledge before you go work on this tactical approach. We don’t just want to win the debate; we want to be prepared to help lead people towards God if we are given the opportunity.